Yesterday was Good Friday. Tomorrow is Resurrection Day. I don't like to let this time of year go past without saying something on my blog about why we celebrate. It isn't because of the arrival of spring, or to give honor to bunny rabbits while we stuff ourselves with boiled eggs and Peeps. All that stuff can be fun, but the real reason we celebrate Easter, as Christians, is to remember our Savior. His death. And how He came to life again, to save us! This is the seventh Easter that I've celebrated since I've been blogging. That's a lot of posts to come up with over the years. This is the most important holiday to me, even more than Christmas. Without Christ's death and resurrection, we could not be saved. That's huge, and I want to always spend time reflecting on what Jesus did for us. So on Thursday I grabbed my old hymnal, hoping to glean some inspiration while the kids were napping. I read through so many hymns. I couldn't find a single one to use today, mostly because I've shared all my favorites before. Finally I just put the hymnal aside, and sat there thinking. I thought about how Jesus lived His life on earth all those years knowing what was coming. And I wondered how He felt when He thought about the death He was going to die. I just had a baby a few months ago. As silly as it is, the thing that flashed through my mind was how I felt late last year. I knew labor was coming soon. I knew how it would feel since I experienced it once already with Wyatt. And last year, as I waited, I felt anxious and scared when I thought about it. But I also thought about what was to come after. I knew at the end I'd be holding a beautiful baby, and I tried to think of that instead. As bad as labor pains can be, crucifixion is worse. It's the most painful way to die, and not only was there the physical pain for Jesus, but there was also all the pain and isolation that would come when the sins of everyone in history were laid upon His shoulders. It can't be compared to labor - I know it was much worse. And Jesus knew that. How did He feel when He thought about it? Was He scared? I think in His humanness He was, a little bit. I think that's why He prayed asking God if there was some other way. But I think Jesus also thought about what was to come after. The Life He would give us when He rose again. And that was worth it to Him. In the words of my hymnal . . .
Jesus Paid It All. On Good Friday. And tomorrow? We remember that Christ Our Lord Is Risen Today! Today is my first day back at work. I would lie if I said I wasn't a bit nervous - I haven't had to work since before Christmas, so it's been a good three months since I've cleaned any teeth! Thankfully I think I have some of my favorite patients scheduled, which always makes the day go by quicker. I'm a little nervous about leaving Gwen for a whole day, but it's just one day a week. And the kids are with my mom. So I can't complain! I bought spiffy new work shoes for the occasion! Fun, right? No where else could I pull off pink and purple shoes. Well, I could, but I like them best for work. It's been a couple years since I bought fresh work shoes, and the other ones were looking really grungy - these make me feel all professional again (and I'm sure my coworkers will breath a sigh of relief that the old shoes are gone)! Anyway, in honor of my first day back, I give you . . .
-Hi, how are you doing? I'm doing well! -We'll be right back here. I'll let you have a seat there. -Okay, any changes in your health history? Are you taking any medications? Do you have any allergies? -Well, it looks like we're due for some new x-rays, so we'll probably start with those if that's okay with you. (Give or take a few times a day, not everyone is due for radiographs). -Alright, I'm just going to start with measuring the bone levels around your teeth. -Would you like to schedule your next cleaning? -Let me get you a toothbrush and I'll walk you up front. There, I feel back in practice now! Obviously there is a lot more personalized instruction and patient education in there, but that's the bare bones of it. Rinse and repeat, eight times a day! Unless I get to do a more involved cleaning, then it breaks it up a bit. Me and my favorite pair of scrubs. Honestly though, I love my job. I like having a routine, but there is still enough of a variety in the patients we see that it keeps it interesting! I'm excited to be back at it. It's time for Gwendolyn's three month update! That's a quarter of a year old already! After this month babies start to seem so much older to me. I can't believe we are already here. At Gwen's two month checkup we found out that she was 11 pounds, 14.5 ounces (57%), and I'm sure she's gained a little since then. She was also 23 1/4 inches long (76%)! She's in size 1 diapers, and we just started using cloth diapers this week. She's in 0-3 month clothes, but she's starting to outgrow some of those and she's fitting into some 3-6 month stuff - I'm kind of in denial that she's that big already. I think during her one month update I mentioned that I thought she might have some food allergies - I thought it was milk, but then she was fine for a month. However, over the last couple weeks her symptoms came back, and through the process of elimination I figured out that she is sensitive/allergic to milk and peanuts. I am hoping she'll outgrow this at some point, but for now I have to avoid those foods. I tested out soy too, and thankfully she's not allergic to that, because soy is in everything! I still need to test out other nuts - if it's just peanuts I might be able to have almond butter or Nutella at least. But we'll see. I hate seeing what milk and peanuts do to her, so I'll do whatever I have to do! Sleep has been improving steadily and she officially slept through the night for the first time on March 10th! It was an exciting day. She has slept through the night many times since. Not every night, but even on the nights she doesn't she usually goes at least a six hour stretch - I'm so glad she's been sleeping so well! She doesn't fall asleep as easily as Wyatt did - she usually complains to herself for 15 minutes, and then she'll suddenly go straight from talking to sound asleep - it always surprises me! We've been doing more tummy time this month, and she's getting better at it, but we have to do pretty short sessions because she gets tired of it pretty quickly. We did break out the Bumbo though! She looks like such a big girl sitting in it. Still not loving baths, but we've graduated to the big baby bath tub, and if the water is warm she'll at least tolerate it. She's been smiling a lot, and I love it! She is way too cute when she smiles. No official laughing yet, but she does sometimes make a coughing sound when she smiles really big, and we've wondered if she's trying to laugh. She loves it when people talk to her - if you say a sentence to her she'll just light up, and then she usually talks back. She really likes to have "conversations", and she'll take turns listening and talking - it amazes me! Wyatt talked a lot at this age, but I don't remember if we had these kind of "conversations". She loves it when people pay attention to her and take her babbles seriously! She has such a sweet personality, and she is such a blessing! What a joy you are to me! Your smiles just cheer my heart, and I love our "conversations". I can't get over how pretty you are, and it makes me laugh, because every time I tell you how beautiful you are you give me a big grin. I hope you always believe me when I tell you that, Sweet Baby, because it's the truth. I'm so happy to have you as my daughter! I can already see what a sweet personality you have, and I am already imagining how much fun we'll have as you get older - talking about everything, having "girl's days" together, painting our nails, shopping. But for right now you are my sweet baby, and I love snuggling with you. You are a little heat bug - you are always so warm when I hold you close to me, and I worry you'll get too hot at times, but I can't bear to put you down when you are sleeping so sweetly against my shoulder. You are so precious to your daddy and me. 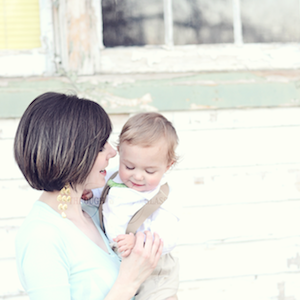 I'm so glad the Lord chose me to be your mama. Well, I had intended to schedule a couple more posts before the end of last week, but instead I kind of fell off the blogging wagon because . . . my sister had her baby!!!! I usually don't use multiple exclamation points in blog posts, but I felt that statement warranted it. This is big - it's the event we've been waiting for ever since Gwen was born! The doctors were afraid she was going to have the baby too early, so my sister was on work restriction for a couple months. Then the little guy decided to stay in there until 38 weeks, which we are so thankful for! But it's been many weeks of not knowing what was going to happen, and now here he is! My sister and I went to MOPS together one day last week, and she had a doctors appointment afterward. She's been having contractions for weeks and weeks, but there were more that day, and shortly after I got home from MOPS she called to tell me they were sending her over to the hospital! So I packed up the kids and rushed down there to hang out with her for a couple hours. Can I just say that it was so weird being on the flip side? So far in my family I've been the one having the babies, and now I was the one waiting for the baby to be born. The suspense just about killed me! And it was hard watching my sister in so much pain. The time at the hospital flew by, and all of a sudden it was 9:30 PM, and I had to get the kids home and to bed. But there is no way I could go to bed too, so I stayed up and sewed her a nursing cover (finally - procrastination at it's finest), baked some cookies, and cleaned my house. Then I finally decided to get some rest myself at 1:15 AM. I slept for a little while and then my mom called me around 4:40 to tell me that my nephew was here! Of course I didn't sleep very well after that, but I got some snatches, and at 6:45 I jumped out of bed, got the kids ready in record time, and started the drive down to the hospital (we're about an hour away). I called my mom all excitedly to tell her we were coming down (my mom stayed at the hospital all night - I probably would have too except for the kiddos), and she hesitated and said "Oh no . . . Ben and Rachel need to get a little rest because they've been up all night." This is what I mean about it being weird to be on the other side. I knew they needed rest - I knew that! I just had a baby, for crying out loud. I knew they'd be tired. But in my excitement to meet my nephew I totally didn't think it through. Anyway, I took the kids shopping at Target, went to Starbucks, and did my devotions for a couple hours, and then I went and picked my mom up from the hospital and we did more shopping and grabbed lunch. And then we finally went over there and I got to meet him! Rachel and Ben have had names narrowed down for a few months, and not knowing what he was going to be named was killing me - I just couldn't wait to know! So that's the first thing I asked and his name is . . . I love the name they picked! It's so strong and masculine, and in the Bible Jethro is Moses's father-in-law and a wise man. It's perfect for him! I'm not going to share any pictures of his little face on here unless I know his mom and dad are totally comfortable, but trust me, his name fits him! He looks like a Jethro to me. He's a very handsome little baby, and you can tell how much he loves his mama. He has this precious little squeak/cry, but he calms down the second my sister picks him up. It's precious. And he looks like a mini Ben - the resemblance is really strong. And can I say how surreal it is to see my sister as a mother? My sister. The one I used to play Barbie dolls with and coerce into tickling my arm so I could fall asleep at night (true story). She's somebody's mother. Little Jethro's mama. My sister. So yes, we've had some excitement around here! Mom and baby are both doing great, and I'm so excited about my new nephew! Gwen is officially allergic to milk. By officially, I mean that through the process of elimination, I have determined that she's allergic to milk. It was a sad day. I am still trying to figure out peanuts and soy, but I'm hoping this is something she'll grow out of - in the meantime, I have to avoid dairy. And as a dairy-loving girl myself, this is pretty detrimental to my favorite foods list. In an attempt to replace my beloved Starbucks, I decided to make some flavored syrup for my coffee, and I have deemed it a success! And it's also cheaper than buying that fancy flavored syrup. So without further ado, here is my recipe for coffee syrup! 1. Bring 1 cup water to a boil. 2. Add sugar and stir until dissolved. Add the flavoring. 3. Stir and simmer on low until syrup reaches desired thickness. Pour into mason jars and store in fridge. And that, my friends, is that! I use a little bit of the syrup and mix it with coffee, rice milk, and ice for a delicious non-dairy Starbucks alternative. I actually think I like it better than Starbucks iced coffee (gasp!). Plus I can make it with decaf coffee. Every time I order a decaf iced coffee (anywhere, not just at Starbucks) I'm informed that they don't have iced coffee in decaf. And I always wonder, why not? Just pour some decaf over ice and serve it to me. But they won't do it. So I guess I just have to do it myself! I'm thinking of making some other flavors too - vanilla, peppermint (so I can attempt a peppermint mocha), coconut? The possibilities are endless . . . The Christian Mama's Guide To Parenting A Toddler by Erin MacPherson includes topics from getting your child to eat healthier, to teaching a love of learning, to getting back to date night with your husband. Each chapter covers a specific topic and give tips relating to that topic, along with a Bible verse and prayer. The moment I started this book, I immediately wondered if the author was a blogger. Something about her style of writing? So I turned to the page with the author's bio, and I found out she is a blogger! Can I call it or what? I guess sometimes bloggers can just spot one of their own. I have to say, I really enjoyed this book. While I did not agree with everything the author said (ex. didn't like some of her suggestions on dealing with toddler tantrums), she included a ton of tips and ideas that I would like to try. Her writing style is easy to read, and I found myself laughing and relating to her stories all the way through the book. When you are a toddler mom it's easy to wonder if you are doing anything right, but she tells it like it is in this book in a fun way. I left feeling encouraged and normal, and like I'm not alone. As I said, even though I didn't agree with everything she said, I would recommend this book just because it was so fun to read, and I think I may look into some of the other books in the "Christian Mama's Guide" series. Note: I received this book for free from Booksneeze in exchange for this review. This is my honest opinion. My goal last week was to try to get a picture of both kids napping. I know, I must like to take risks! It was bit tricky to get pictures without waking them up, but I'm happy to report that both attempts were a success and they proceeded to take full naps. I think Gwen looks like a baby doll in these . . .
Of course the day I decided to do this Wyatt decided to sleep in a very difficult-to-photograph position, but I still like the way it turned out, with his messy hair and his little fingers curled around his nose!